Attention SMB owners, Google has announced huge changes to the way Chrome displays unencrypted HTTP pages that will scare away your visitors with alarming warnings. Un-encrypted pages are less secure than encrypted pages. You can tell un-encripted pages because they begin with HTTP. Encripted web pages begin with HTTPS. Visitors to the page can click the icon to view information about the pages, including security details. Roll out date guesstimate is Friday January 13 2017 for Chrome Version 56. Why Friday the 13th? 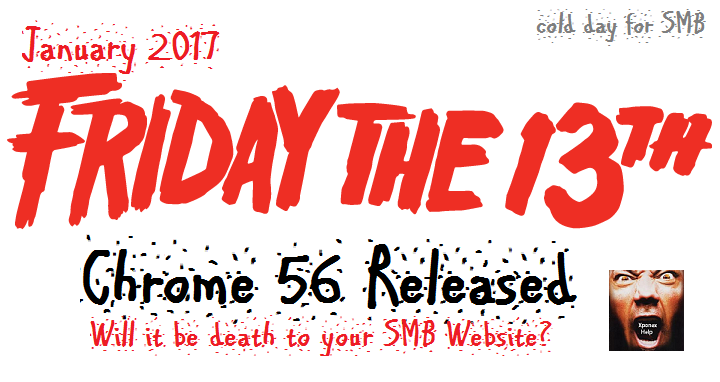 Maybe because for many SMB websites it will be a very scary date. One that you will remember for years to come. It could even mean death to your website. When Version 56 of Chrome is released all HTTP pages that collect passwords, credit card, or other secure information will be labelled by Chrome as Not secure. The red warning will be displayed on all HTTP pages, even if no data will be collected. The average user will not visit any website with such a warning. Worse yet, Google will have likely removed your webpages from Google search results. Your traffic will likely be cut significantly. If you noticed, this site and all other sites hosted by Xponex automatically come with HTTPS. You could move your site to Xponex media or purchase a security certificate from GoDaddy, Network Solutions, DigiCert to name a few. If your SMB is interested in working with an SMB host company with real people who answer the phones, try Xponex. The website is Xponex.com or call 513-422-3101.